I wonder if the Prophet 12 will be replaced next. That would seem logical. In the past, hasn’t there been very little time between the announcement of a discontinued model and announcement of a newer one? It will... i can feel it somehow... but you can be certain, that the P12 will have something, that some would want, that the new one will not have... just like many still miss some of the Evolver features in the P12. I would find it very difficult to see how the P12 could be preferred over an updated version. No digital effects, no sequencer...nah I think this new instrument is going to blow both the Poly Evolver and P12 out of the water. Now what would remain to be seen...err...heard rather, is if it will blow something like the Peak out of the water. It would be cool to see John Bowen and Dave collaborate for this one. I know I know two collaborations in a row but John has been by Dave’s side during the early days of the Prophet 5 and helped with the Prophet VS, it would be nice to see Bowen’s idea for the front end of the Solaris (with an insane amount of oscillator and Wavetable options) going through the Pro 2s dual analog filter concept (an SSM based filter and state variable SEM based filter). Add the VS/Solaris joy stick and a MPE supported ribbon controller, maybe 4 part multitimbrality, 10 Voice polyphony with an expansion card to 20 voices and you would blow almost everything else on the market out of the water. I could never buy the claim that the P12 is an updated Poly Evolver. I used the two instruments side-by-side and found them to belong to totally different categories. One could not replace the other in a meaningful way. Instead, I thought they nicely complimented each other. No, I'm still waiting for the new Poly Evolver. But still, that is what replies have been from DSI when the topic of a new Evolver have been up... That is why I do not believe that any new digital front end synth to replace the P12 will make the P12 redundant in any way...I still crave some features from the Evolver that only it can do... Mixed oscillators, true stereo path, user waveforms and the sequencers. Part of me is hoping that, since Tom has wound up his own production, there might be some further Oberheim/Sequential collaboration. I’m in that slightly annoying position where I’ve saved up for my first poly and don’t know whether to go for something that’s already out there or wait and see what’s around the corner. I wasn’t taken with the P12 (neither the filter, the feel of the keybed nor the lack of sequencer/effects appealed to me), which is a shame as other aspects were very appealing (4 oscillators, linear FM, 5 octave keyboard, extra performance sliders, deep mod matrix). Of the remainder it’s between the P6, OB-6 and Rev 2 and I like them all for different reasons. I’d rather have 5 octaves but the P6 and OB-6 sound so good. I also connected really quickly with these two and got into making good sounds fast. The Oberheim filter is lovely. I also really like the idea of having a live panel mode. Dual effects is a welcome bonus too. I’m torn, on the one hand, the immediacy of the P6/OB-6 means I’m more likely to come up with musical ideas. The Rev 2 I’d probably spend much more time programming (which I’d also enjoy). IIRC, at NAMM 2013 the P12 was announced as a product that combines what were considered the best parts of the Evolver and those of the Prophet '08, which makes more sense in my opinion. Out came a synth that was as different from the Prophet '08 as it was from the Evolver. Certainly. Given that philosophy, though, I also wouldn't expect a direct follow-up if any. Sequential never really did release any replacements or upgraded versions with the exception of the Rev2. I don't think we'll see the same happening with the Prophet 12 or any other already released synth, especially if you take into account that – at least from nowadays perspective – the Prophet X took over the role of the Prophet 12 as a flagship synth. I know, I know. It's been the standard line around here that the P12 is the new Poly Evolver. Sorry, but not by a mile. Without the exact same panned frothy digital oscillators and even the extremely long envelope times, there's little sense in making the claim. To do so was to mischaracterize the instrument and mislead the interested synthesist. To me, the P12 was a whole new synthesizer - brilliant in its own right, but altogether new and distinct from the other DSI/Sequential instruments. Yes, that makes a bit more sense as a reference point...and yet, it's still not how I would have described the instrument. The three synthesizers - the Poly Evolver Keyboard, Prophet '08, and Prophet 12 - would make a superb ensemble because each is substantially distinct from the others and in no way resembles the other's voices. That's true. And I think it's realistic to expect the next instrument to be just as complementary. After all, the Prophet X followed the same approach. It's not a replacement for any of these synths, but it incorporated certain elements from older synhs (hybrid oscillator section, stereo filters, doubled FX from the Rev2, etc.) while adding the sample playback. I really cannot see the Prophet X as taking the place of the Prophet 12... the digital side has been drastically reduced... waveforms are gone, the FM part is "broken", it lacks two of the oscillators, has no HiPass filter per voice (analog)... there are just so many things that was not ported over... this is also why I'm probably not going to wait and see what they come up with next time because I want a Prophet 12 next... no matter what. I didn't mean functionally, but in terms of being Sequential's new flagship synth. First was the PEK, then the Prophet 12, now the Prophet X. Each one is different of course. How do you figure this? They have pretty different architectures, oscillators, voice counts etc... it's pretty hard to reproduce either one with the other, when you are working towards what they are best at. Seems more accurate to say the P12 was a new synth that took some inspiration from the Evolver line, but that had it's own DNA from the start, no? First was the PEK, then the Prophet 12, now the Prophet X. Each one is different of course. Crap. When you put it like that, I guess I *WILL* have to get a Prophet X someday. I wouldn't want to invite discontinuity. Considering the situation, I wouldn't be surprised if there was yet another Oberheim-ish project of a larger sort at Sequential. I would also be interested in such an instrument. I've long been a closet Oberheim guy. My intention had been to remain with Sequential, but also to add an Oberheim instrument or two. I've always thought their respective sounds wonderfully complimented each other, like sonic brothers. ...I still crave some features from the Evolver that only it can do... Mixed oscillators, true stereo path, user waveforms and the sequencers. I would like a module that has the four Evolver oscillators, but with a a sub-oscillator and a method to upload user waves. Inputs for the various modulation destinations that are on the original and the slop function. The rest of the Evolver is doable using other modules. That would make me happy. I know that I could pull-off the digital waves with other modules but it's the Osc FM combined with stepping through the waves on the Evolver that sets that it aside from regular digital wave based oscillator blocks. 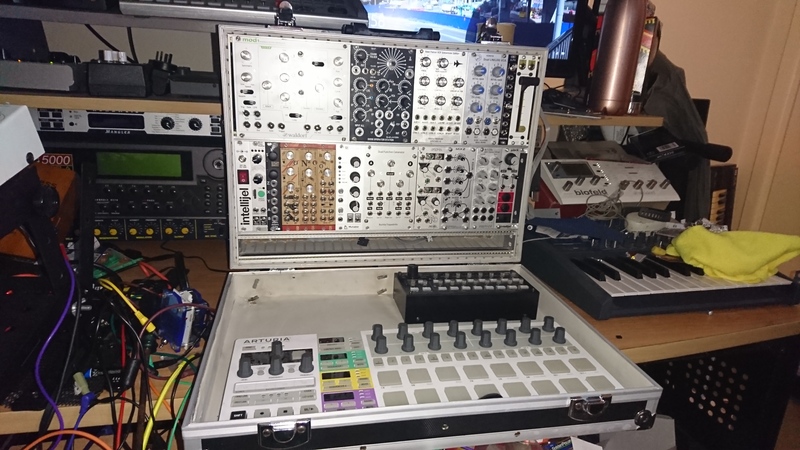 Having that in the Eurorack format would be far more flexible than using an Evolver along side of a modular synth. I'll not be foolish and hope for a revised Evolver... i do not believe it will happen, and thus, when I have the money, and the opportunity, I'll simply just get a second hand PEK... problem solved. i actually stopped guessing at what Sequential would be doing next because it really serves no current purpose, other than the dreaming away. I have an interest in anything hybrid/analog with a deep synthesis engine these days... thus Evolver, Prophet X and Prophet 12 are all on my wish list along with the Waldorf Quantum ... Prophet 6 or OB-6, though probably very well sounding synths, simply will not give me what I want when it comes to the synth engine... it's not deep enough, not enough modulation capabilities. and on top of these requirements, the synths must also be with stereo outputs. I need to be able to modulate each voices panning as a minimum, so no mono-output synths will cut it either.